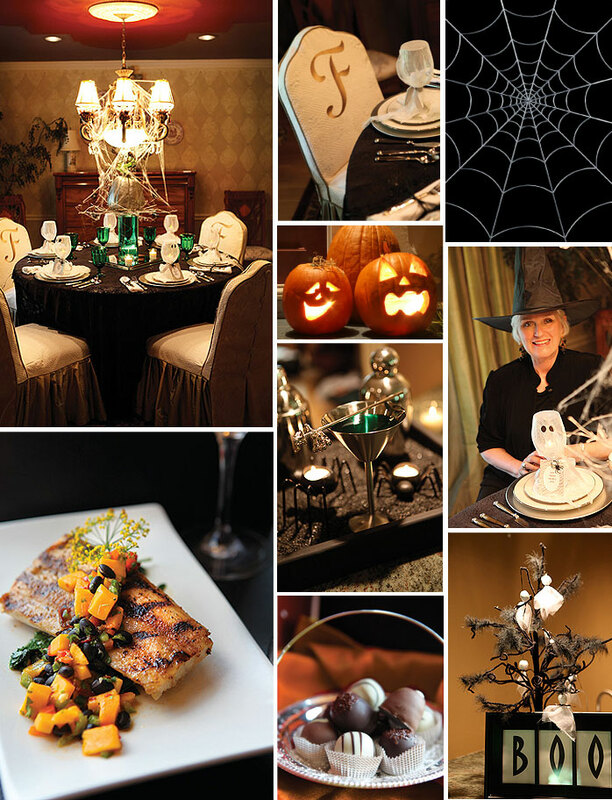 In the heart of Chesterfield lives the “Good Witch” of West County, loved by all in her kingdom and rumored to put a spell on her guests to inspire them to entertain beautifully. 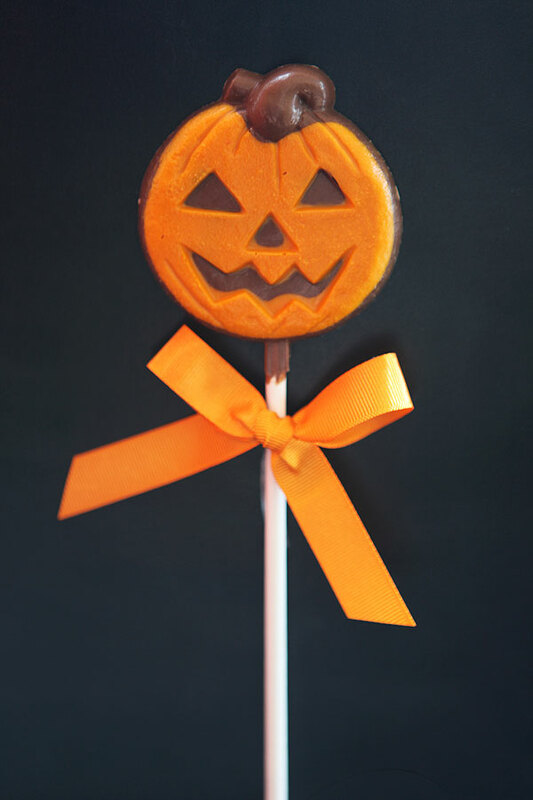 Of course, Nancy is not really a witch, but when Halloween comes around, she is not reluctant to don the witch’s hat, decorate her beautiful home, and prepare a dinner party that will bewitch all her guests. One year, Nancy created a tablescape that was as whimsical as it was sophisticated. 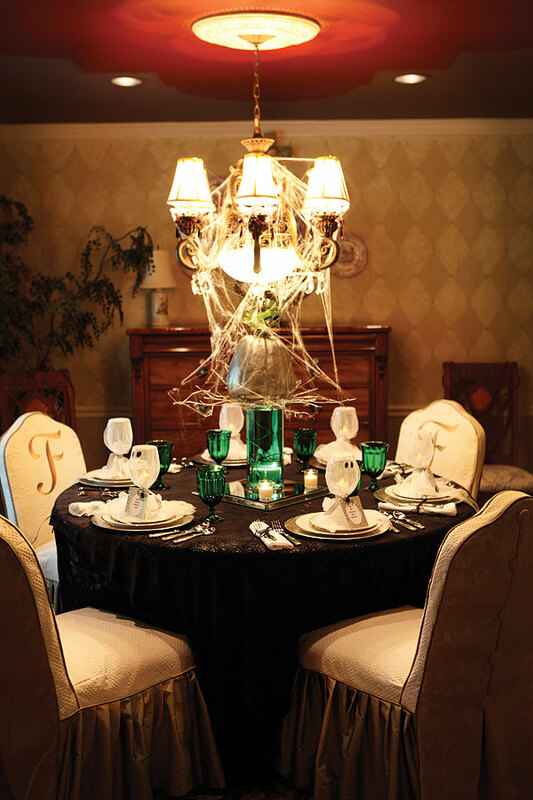 The color theme was a ghoulish green accent color… a fun surprise for her guests, but also appropriate for the holiday. Other colors in her palette were black, white, and silver, with just a touch of orange. 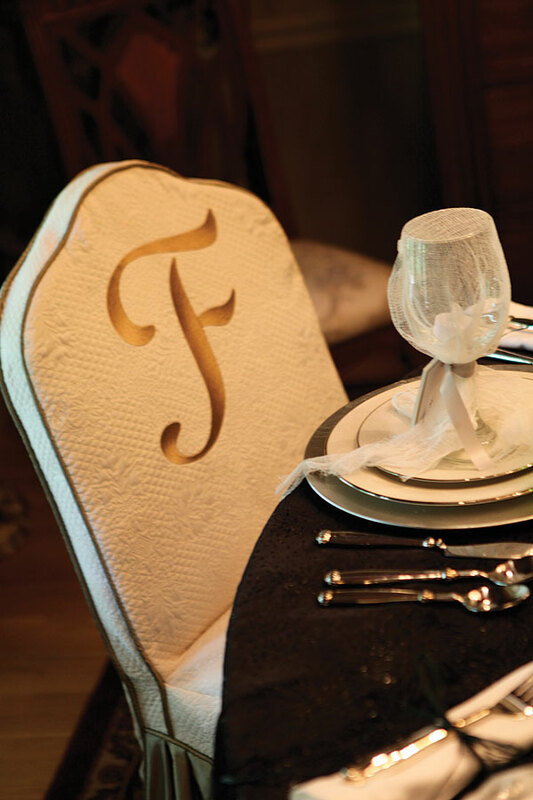 And for a personal touch, the monogrammed chair covers stole the show, which Nancy, a talented seamstress, created herself. 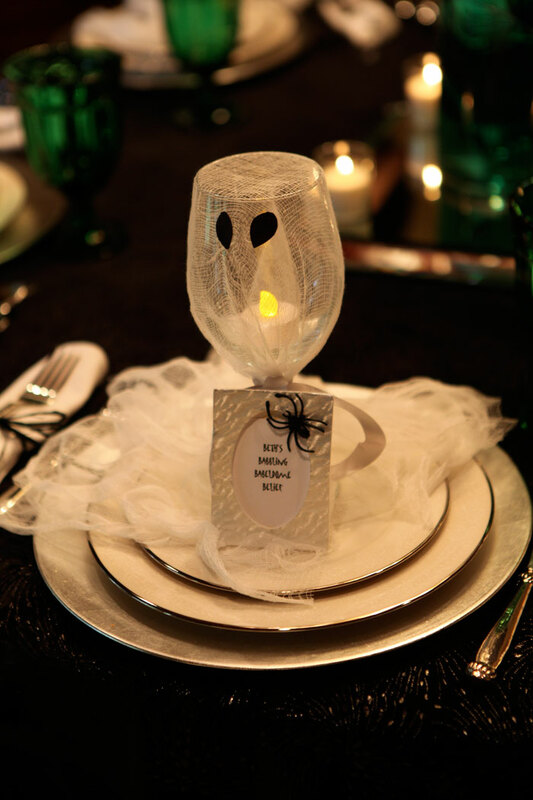 Her adorable ghostly place settings were composed of a simple collection of cheesecloth draped over a clear wine glass and tied with a double satin gray ribbon. 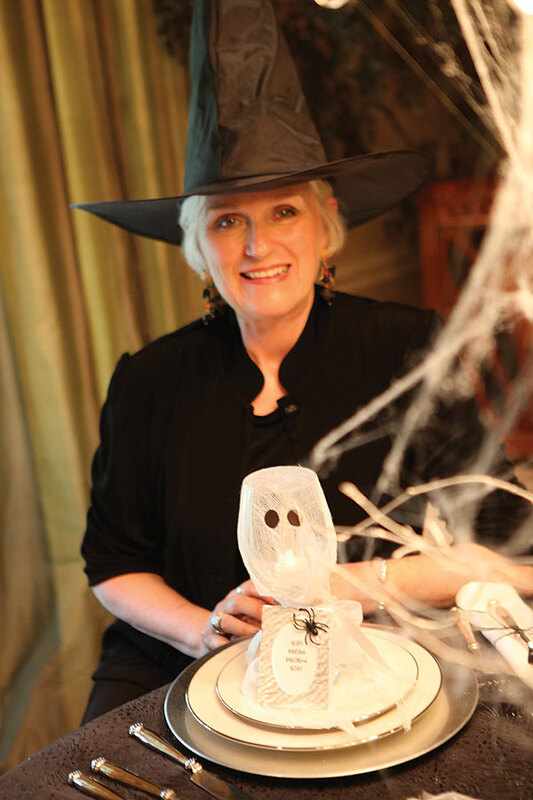 To make the ghosts come alive, Nancy cut out black ovals for eyes from construction paper. Inside the glass, a battery-operated tea light candle made the ghostly glow perfect for a spooky ambiance in the dim light of the dining room. Nancy was clever indeed with the place cards, using playful alliterations of each guest’s name (such as “Hal’s Hauntingly Hidden Hagioscope”) to lead everyone to their seats. 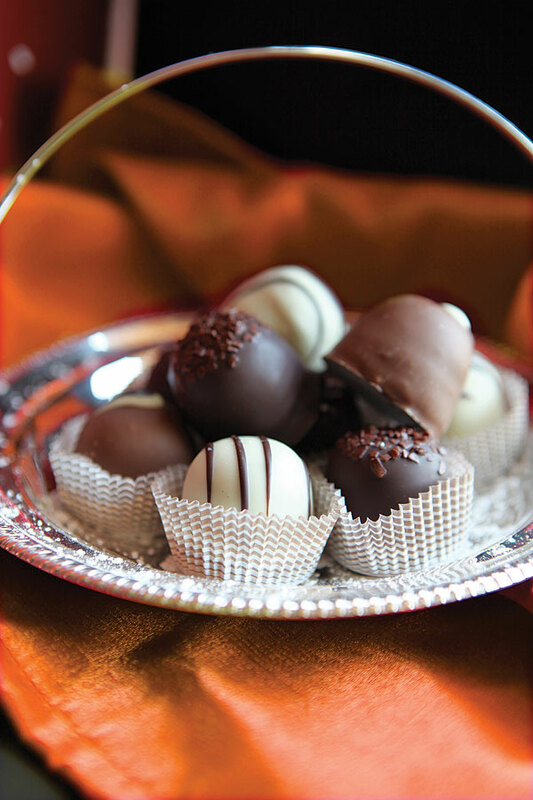 Those who knew what the sometimes obscure words meant earned an extra surprise of handmade chocolate truffles. 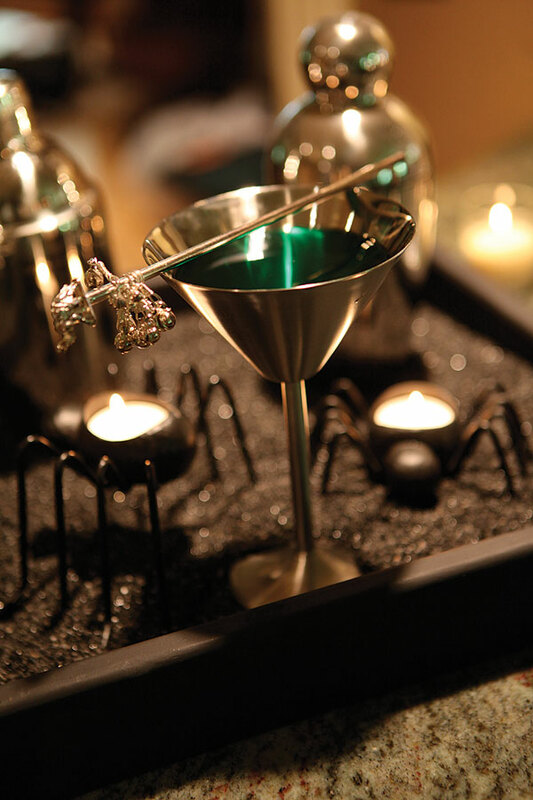 The drink of the evening was a ghoulish green concoction called “The Green Haze”, a mix of crème de menthe, gin, and pineapple juice that was the perfect brew for a Halloween evening. 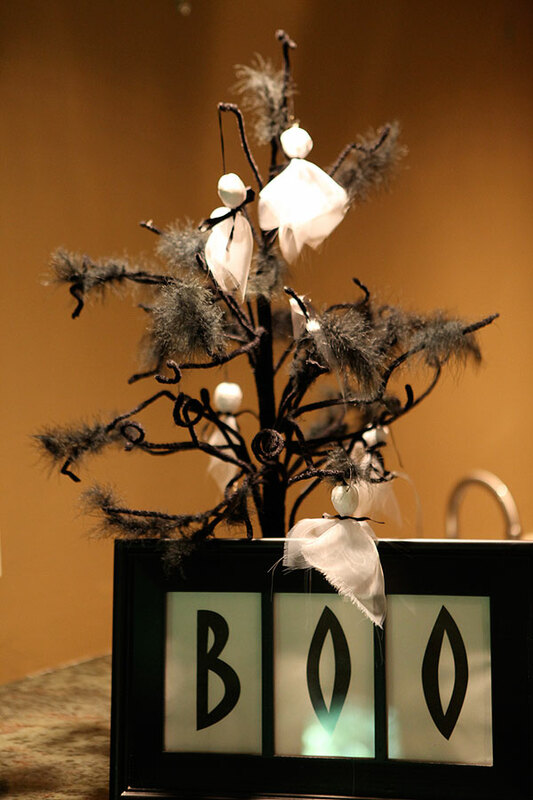 Other fun items included a “ghost tree” and fun menu holder made from a simple frame and embellished with bats. For a striking centerpiece, a large pumpkin was spray-painted silver, nestled on silver spray-painted branches, and perched on a clear cylindrical vase. The inside of the vase was wrapped with silver wire “crawling” with black spiders. 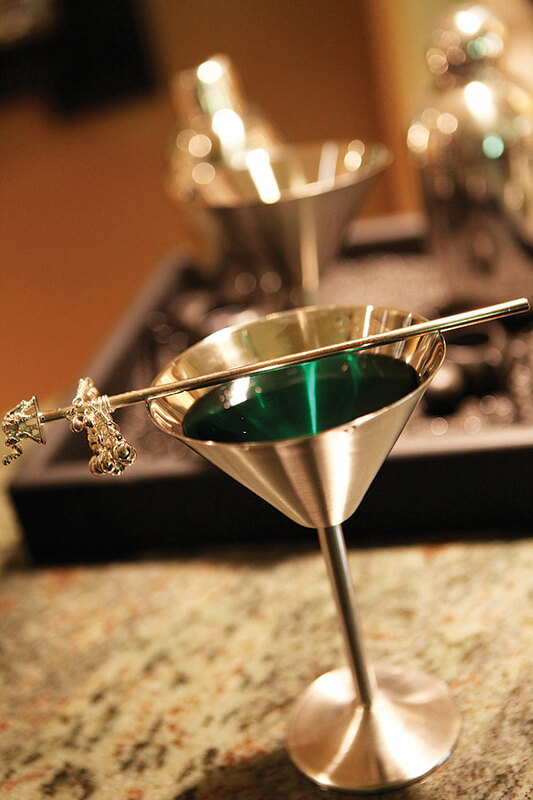 It was filled with water treated with several drops of green food coloring. 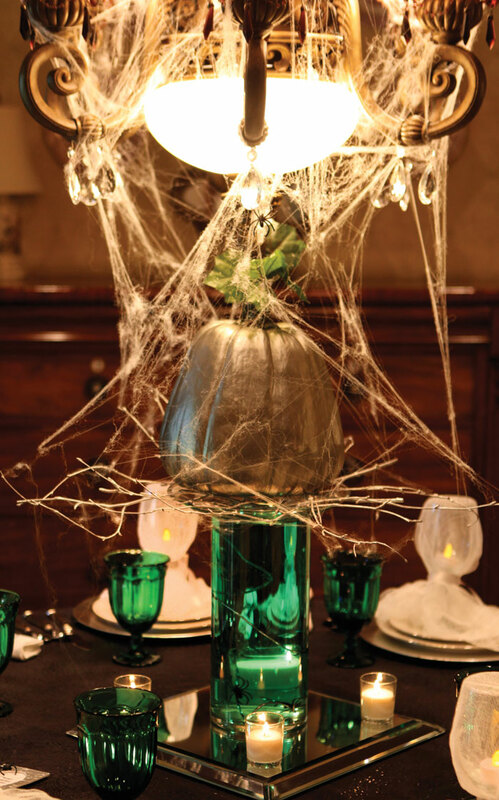 As a final touch, Nancy wrapped the centerpiece with faux spider webbing that reached as high as her chandelier. The entire centerpiece was resting on a mirrored tile surrounded by votives. 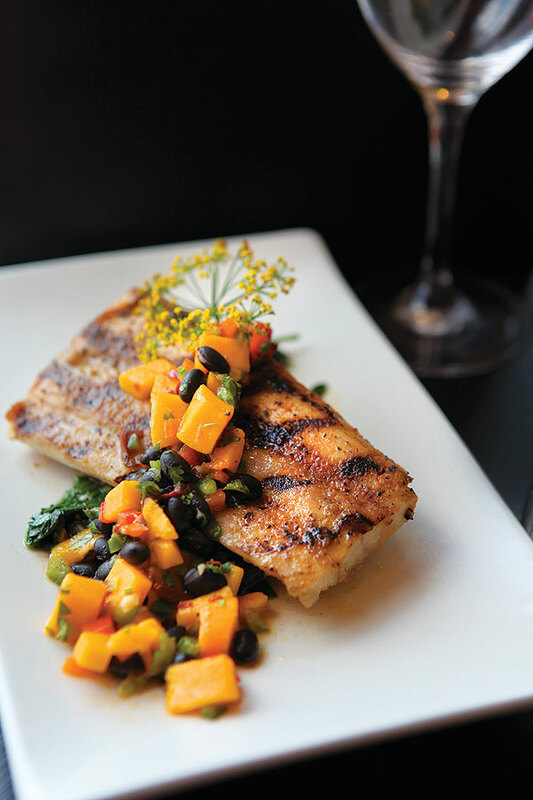 The menu for the evening came straight from Chef Greg Tournillon. 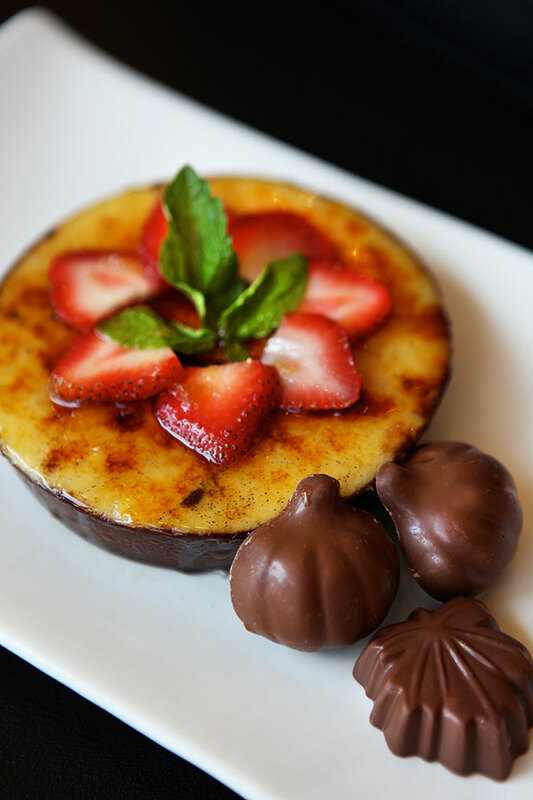 From Mahi-Mahi to Crème Brûlée, Greg’s dishes coupled with Nancy’s style made for an incredible treat — no tricks required!